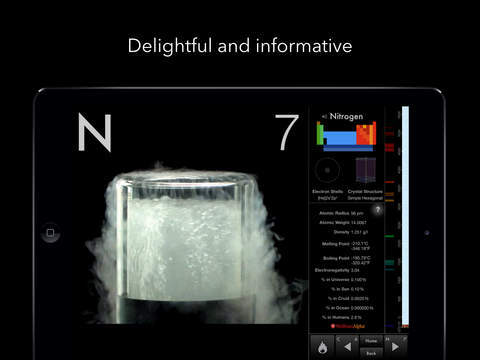 Students learning about the periodic table will want this app on their iPad. It's a must-download for schools, libraries and anyone creating a reference list for the best apps for studying chemistry. Since April 2010, this app has continued to be a popular and often copied app-style for education. A solid scientific app for students! Our highest recommendation. Of all the periodic table apps, there is only one which Stephen Fry described as “Alone worth the price of an iPad!”. The Elements: A Visual Exploration is not just a reference app, it is a rich and engaging love story of the periodic table, told in words and pictures, and allowing you to experience the beauty and fascination of the building blocks of our universe in a way you've never seen before. The Elements is based on the internationally best-selling hard cover edition of The Elements by Theodore Gray, Popular Science Magazine’s Gray Matter columnist. But it goes way beyond what is possible on paper. You start off at a living periodic table where every element is shown with a smoothly rotating sample. To read about tin, tap the tin soldier. To read about gold, tap the gold nugget. Immediately you see the sample filling nearly the entire screen, photographed to razor sharpness and rotating around a complete circle in front of your eyes. Beside that is a column of facts and figures, each of which can be tapped to bring up rich detail and current information through the embedded Wolfram|Alpha computational knowledge engine. Go to each element's second page and you find a fascinating story about the element, surrounded by carefully photographed objects representing it. 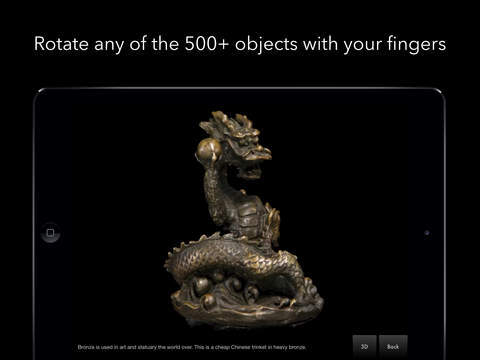 Every one of these objects, well over 500 in total, is a freely rotatable, live object that you can examine from all sides and pinch zoom to see in unprecedented detail. Pinch-zoom or tap any object to bring it up full screen, where you can split into a pair of stereo 3D images. Using inexpensive 3D glasses you can see all 500 objects pop off the screen in 3D, and you can spin the objects, in 3D, with the touch of a finger. You can’t get much more virtually real than that. If you had a bad experience with chem class in school, this book is the antidote. If you or someone you know is afraid chemistry will be their most boring subject, this book will show them that there’s a lot more to the periodic table than a bunch of numbers and letters. We have not reviewed any other apps from this developer.